I am currently on vacation in Czech Republic so it is the perfect time to speak about exchange rates. Any Canadian that has travelled in the past couple of months has noticed the drop in the strength of our dollar. In the news and when politicians speak about the dollar is it always measured against the U.S. dollar. This makes sense because, as we have discussed many times, the U.S. buys the vast majority of our exports. When the Canadian dollar becomes weaker, out products become less expensive to foreigners so it can be a positive thing for exporters. So here is the relative price of the Canadian dollar to the USD for the last year. I also included the Czech karuna on the right axis for fun. The lines show how much Canadian you can get for each. So higher means a weaker Canadian dollar. So the Canadian dollar has fallen in value against the USD as well as the Czech karuna. Another way to check the strength of currency is to use an index number that takes into account all of our largest trading partners. 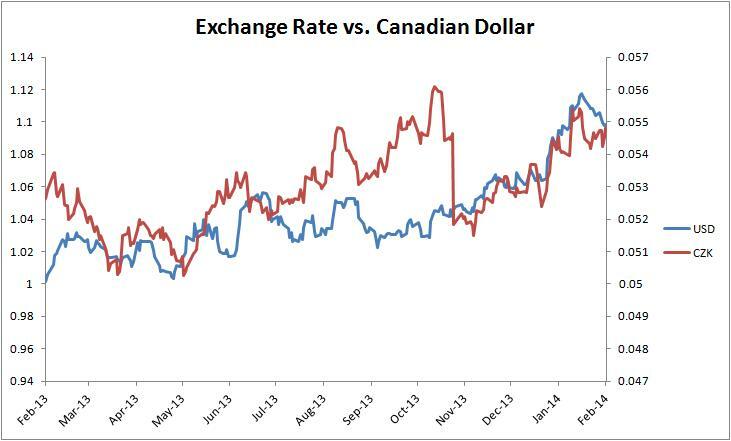 The Bank of Canada does this and it is called the Canadian-dollar effective exchange rate index (CERI). If you would like to know the exact weights that each of our trade partners gets you can see them here. 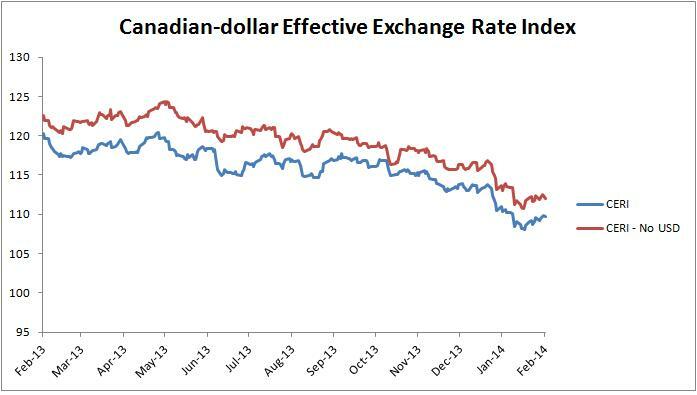 The graph below shows how the strength of the Canadian dollar has fared in the last year according to the CERI. Higher means a stronger Canadian dollar. The CERI data tells much the same story. I included the CERI without the USD to see how much difference it would make but it was almost none. So our conclusion is that if the indexed strength of the Canadian dollar determined my vacation times I would probably going to work tomorrow. Good thing it doesn’t, na zdravi. What Happens if the US Hits the Debt Ceiling? The shutdown continues in the US and now we must consider the possibility that the US government will not only fail to pass a new budget but will also fail to raise their debt ceiling before October 17th. This is the estimated day that the US will run out of cash to pay for existing programs and debt interest. If congress does not raise the debt ceiling, which is an artificial limit imposed on the maximum amount of total debt the US holds, government spending will need to be cut by about 20% instantly. This is because the US borrows about 20 cents of every dollar it spends. In Canada when the government passes a budget and spending plan it is automatically authorized to spend that money. In the US it is a two step process. The government passes a budget in a vote and then must vote to authorize the borrowing that goes along with that spending. Many people are reporting that if the debt limit is not raised that the US will default on its debts, something that has never happened. This is not entirely accurate. I do not know the exact number but approximately 7% of US government spending is debt repayment, the rest is spending on government programs. The government could try to prioritize the debt payments to keep them from defaulting while cutting the 20% elsewhere. The main problem is that the US is a big place and their national accounting is supremely complex. This is the reason why they say that October 17th is most likely the day they run out of funds, the flows of money to and from the government are not constant and are difficult to pinpoint. A default on debt repayment would cause a financial freeze far worse than what we saw in 2008-2009. During that crisis when things were going bad everyone rushed to US treasury bills. The interest rates on these bills are super low because they are considered safe. That is, the possibility of the US government not paying their debts is almost zero. If default starts to look like a possibility then interest rates on those treasury bills starts to climb. This causes all interest rates to climb as people start getting worried about risk throughout the market. This means higher mortgage rates, higher personal and commercial credit rates, higher rates all around. This also means that when the US tries to roll over old, expiring bonds into new bonds (this occurs once a month normally) bond holders will either just cash out or they will want higher interest rates. So the government would be paying higher interest on their current debts which means more government cuts because the ceiling would still be in place to limit borrowing. So, is it possible that a few Republican crazies will cause the US to hit the debt limit? Yes. Will it cause a financial apocalypse? Possibly. Even if the government can arrange to prioritize debt payments with their remaining money they will be making massive, instant cuts to government programs. This means tens (or hundreds) of thousand of laid off workers, decreased income tax revenue and an increase the need for social benefits. It would be an economic tranquilizer. This situation is going to reveal just how much the Tea Party is willing to damage the US in order to push their agenda. Normally,Webernet.ca does not make dire predictions but if they refuse to raise the debt ceiling for any significant period then both the US and Canada will drop into recession. If the ceiling remains in place long term then the US is headed for a depression and Canada will not be far behind.